The United States Mint pulled back the curtains today to unveil information and final designs for the curved Apollo 11 50th Anniversary Commemorative Coins that launch on Jan. 24, 2019. 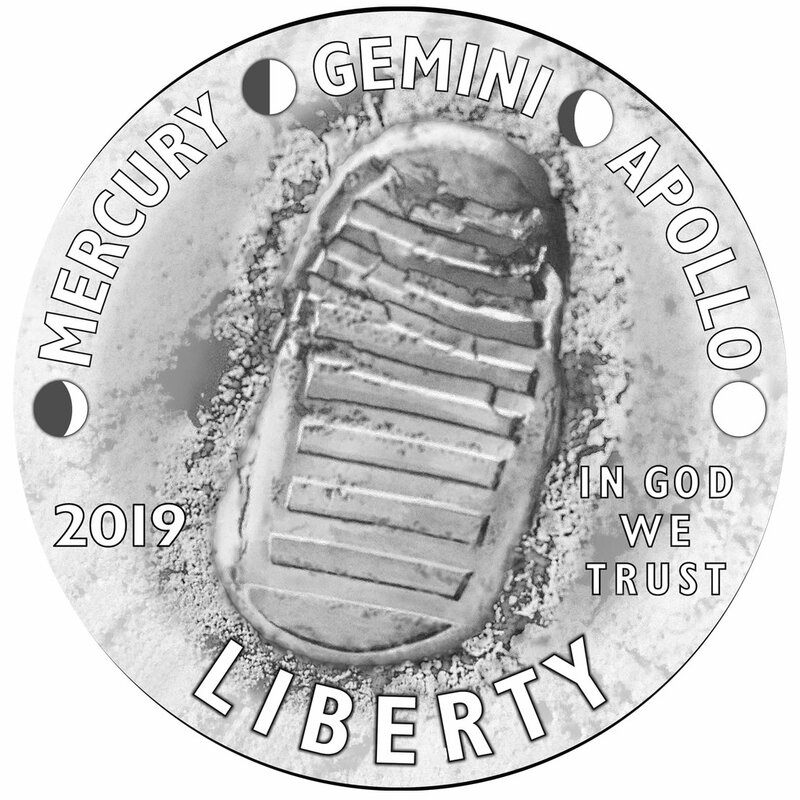 Obverse and reverse designs for the 2019 Apollo 11 50th Anniversary Commemorative Coins. These designs will be shared on 7 curved coins that will be minted in gold, silver and base clad metals. The coins will be struck in four different sizes with their diameters ranging from 0.85 inches to 3.00 inches. 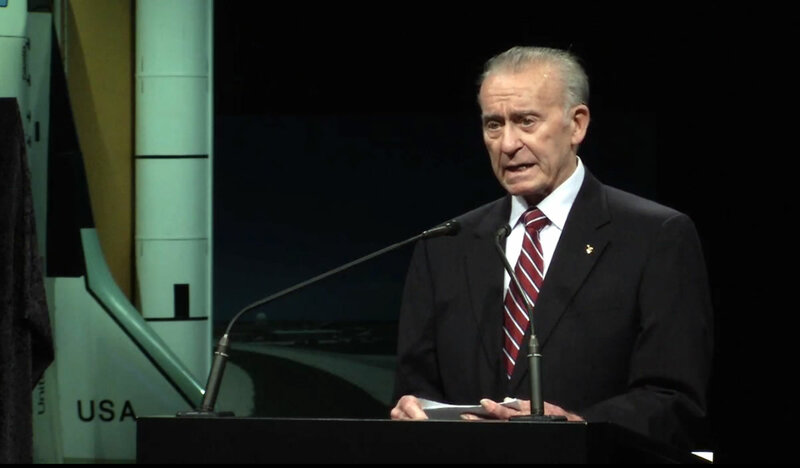 An event revealing the designs kicked off minutes ago at the Smithsonian National Air and Space Museum in Washington, D.C., featuring guest speaker Apollo 7 astronaut Walt Cunningham. In commemoration of the 50th anniversary of the first manned landing on the Moon, the U.S. Mint is striking $5 gold coins, 5-ounce silver dollars, 1-ounce silver dollars, and clad half-dollars. All of them will share common designs and a curved shape. The U.S. Mint produced its first curved coins four years ago in celebration of the 75th anniversary of the National Baseball Hall of Fame. They were enormously popular. Apollo 11 50th Anniversary Commemorative Coin will be curved in shape similar to the 2014 National Baseball Hall of Fame Commemorative Coins. 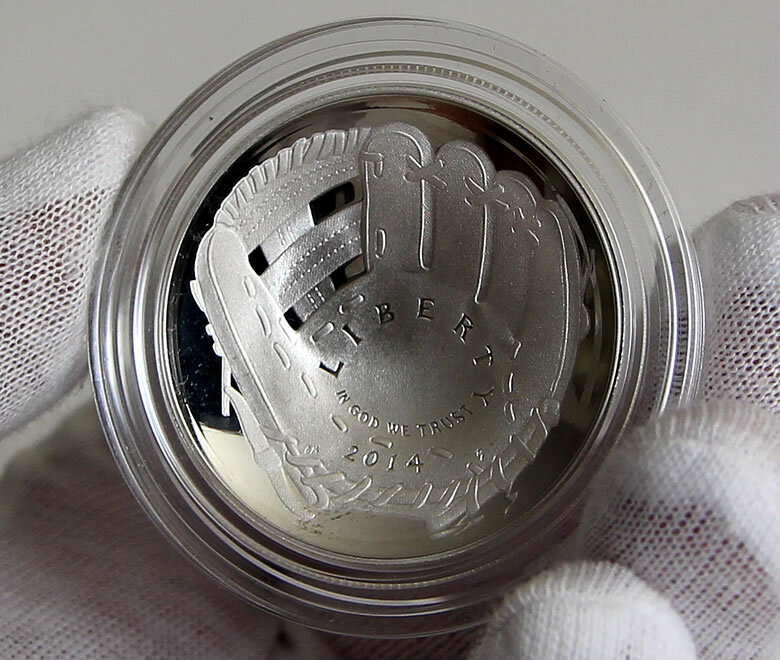 Shown: A CoinNews photo of a 2014-P Proof National Baseball Hall of Fame Silver Dollar. Gary Cooper’s artwork won among candidates for the coins’ obverse (heads side) design. 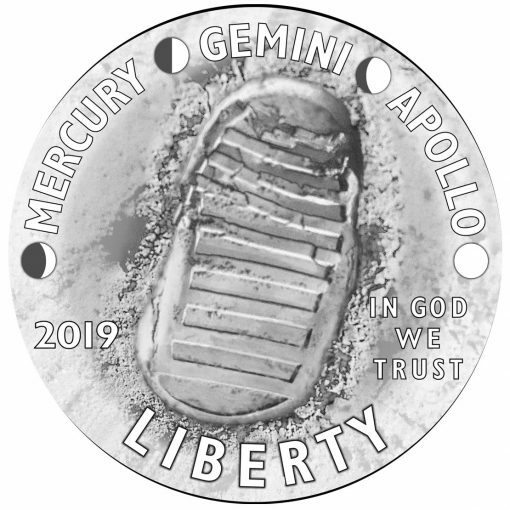 Engraved by Joseph Menna, it features the inscriptions "MERCURY," "GEMINI," and "APOLLO," separated by phases of the Moon, and a footprint on the lunar surface, which together represent the efforts of the United States space program leading up to the first manned Moon landing. Additional inscriptions include "2019," "IN GOD WE TRUST," and "LIBERTY." Designed and engraved by Phebe Hemphill, reverses depict a representation of a close-up of the famous ‘Buzz Aldrin on the Moon’ photograph taken July 20, 1969, that shows just the visor and part of the helmet of astronaut Buzz Aldrin. The reflection in Buzz Aldrin’s helmet includes astronaut Neil Armstrong, the United States flag, and the lunar module. Inscriptions include "UNITED STATES OF AMERICA," the denomination, and "E PLURIBUS UNUM." The U.S. Mint will produce 7 coins in total, making them available in varying mintages, collector finishes, denominations, and compositions. It will also strike a unique Kennedy 50c as a part of the 50th anniversary celebrations. Available U.S. Mint specifications for the Apollo 11 coins follow. The 3-inch 2019-P Proof Apollo 11 50th Anniversary Five-Ounce Silver Dollar marks several firsts for the U.S. Mint. It will be the agency’s first 5-ounce piece that has a proof finish, a reeded edge and a curved shape. The Mint’s existing lineup of 5-ounce products includes bullion and uncirculated coins having America the Beautiful quarter dollar designs and flat edges. This CoinNews photo shows the second 2018-dated America the Beautiful coins from the quarter and 5-ounce series honoring Apostle Islands National Lakeshore in Wisconsin. It highlights the large size of 5-ounce coins. 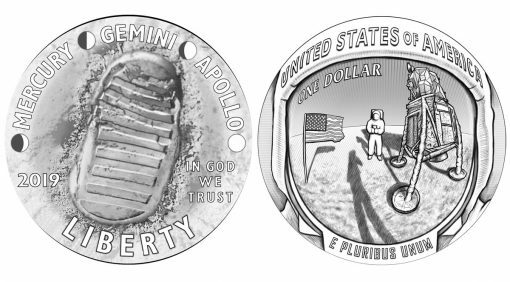 Additionally, look forward to a half dollar set with coins from the San Francisco Mint that celebrate the correlation between President Kennedy and the American space program. This set will contain one 2019-S Proof Apollo 11 50th Anniversary Half Dollar and one 2019-S Enhanced Reverse Proof Kennedy Half Dollar. It will be limited to 100,000 units and have a household order limit of 5. Coin prices are yet to be announced. The U.S. Mint did say that it will offer discounted pricing during an introductory period from Jan. 24 to Feb. 25. Prices will include surcharges of $50 per 5-ounce silver dollar, $35 per gold coin, $10 per silver dollar, and $5 per half-dollar. Provided the coins turn a profit, the collected funds will be shared between the Smithsonian Institution’s National Air and Space Museum’s Destination Moon exhibition; the Astronauts Memorial Foundation; and the Astronaut Scholarship Foundation. The Apollo 11 50th Anniversary Commemorative Coin Program is authorized by law only for calendar year 2019, meaning the U.S. Mint cannot issue or sell the 7 coins in any other year. They will be sold via the United States Mint’s online store, catalog.usmint.gov, toll-free number, 1-800-USA-MINT (872-6468), and over-the-counter at various United States Mint sales centers. Very disappointing designs – I was hoping for a full depiction of the moon. It seems like they are trying to jam too many thinks onto one coin lately – they should stick with the main theme/image in my opinion. The astronaut looks like a Lego figure. A moon would be awesome! The Australian mint has a series of domed coins, but a pure image of the moon would be sweet. In mockup it looks, like a cartoon image, let’s HOPE it is better, the obverse is cool but for all SEVEN coins……only the USM cold seemingly mess this one up…. They need a Pd to save this program…..
Oh, and no reference to 1969……goes well with the Commem to celebrate JFK`s 102nd birthday….. I think it looks more like a Florida Cockroach. They should have used a no-see-um bug!!! LOL Please no more crappy com coins. Was this Canadian 2017 fossil coin the inspiration? 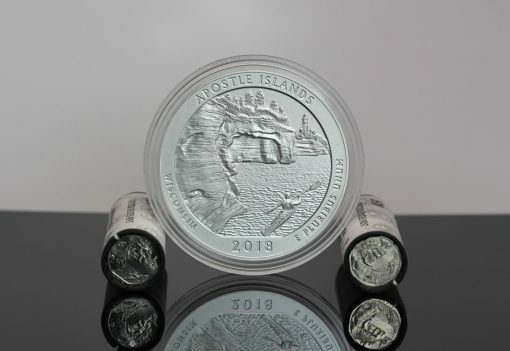 Will the 5oz dollar contain a designation that it is “99.9% Silver,” like the 5oz ATB quarters? If so, I’d consider the 3-inch Apollo dollar as bullion and not a commemorative coin… Because if you consider the 3-inch Apollo dollar to be a commemorative coin, then all the ATB 5ozs should also be considered commemorative coins. Good point – and with the $50 surcharge it will likely be $204.95 – I’ll pass. I am not thrilled with the obverse but I certainly didn’t want to see Kennedy on another coin. I stopped buying commemorative coins due to the absolute hideous designs that have flowed out of the CCAC and CFA like a backed up sewer pipe. I also stopped because of the insane pricing – $35+ dollars for $14.80 in silver. 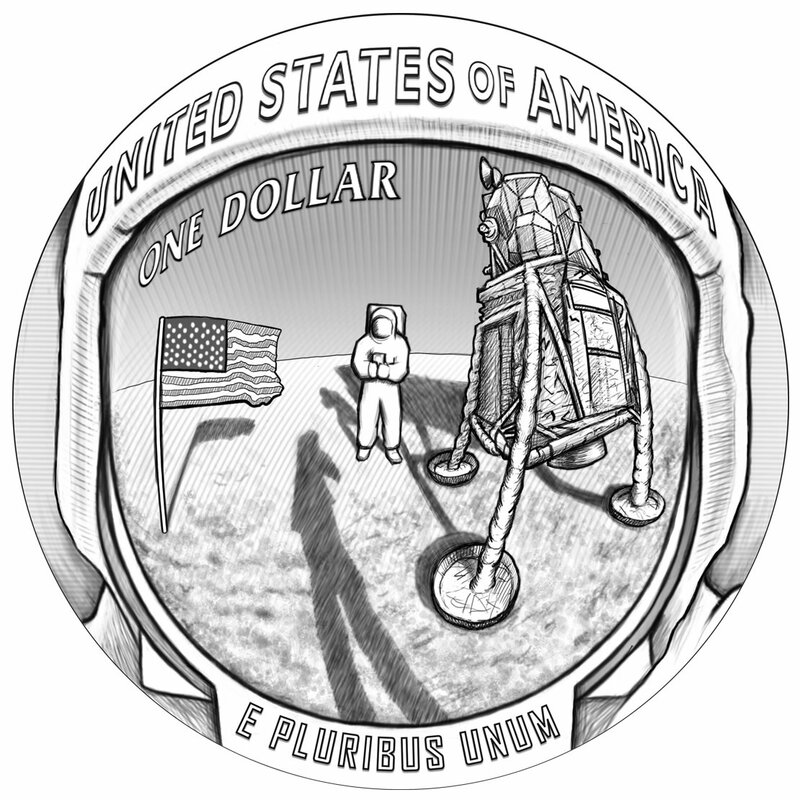 However – due to the nature of this and a fact that I am a huge space fan and watched this landing live – I may breakdown and buy the dollar coin. the information here about the small one dollar silver coin is that it is made of 900 silver with a weight of 26.73 grams. But that isn’t one ounce as written above. the description of the usmint is that the coin is 99.9% silver and the weight is 26.73 grams. Which leaves me a bit confused. so disappointed with the reverse design of this coin.. The obverse reminds me of a Fossil Trilobite (order Asaphida), or some other prehistoric fossil. 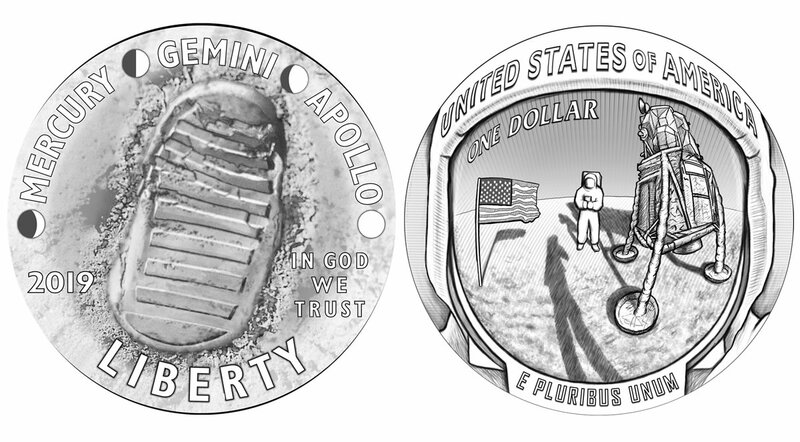 I mean no disrespect to the astronauts and I will be getting some of these coins. A lot of the comments are criticizing the design of the coin. Let’s all not be too critical I’m sure the coin will look much better in person than on the internet. I’d bet money many of you guys will purchase it anyway. Will jump all over the 5 oz. silver coin. I love the low mintage and buy as much as I can. Your grandchildren will think you were a coin buying God!!! Getting some gold ones as well. BTW, I’m not a robot. Me, too, David. That’s my purchase: the 5 ounce coin. Mike Mezack is the coin buying God!!!! Repeat Repeat Repeat…!!! Wondering if the Kennedy Half in this set will be the lowest mintage ever of a Kennedy Half with the exception of the 2014 Gold proof coin. I see the product limit is 100,000. The mintage limit is 750,000. I don’t see any other products that might include this Kennedy Half. Meaning the 2-coin “S” minted clad half dollar set w/enhanced reverse proof Kennedy Half.